Entering her final season of outdoor eligibility after an injury cut short a promising 2012 indoor campaign.. posted collegiate-bests in mile (4:43.33) and 3000m (9:22.57) before her season ended…talented and versatile athlete who is capable of competing at a high level from 800 to 5000 meters…consistently performed as No. 3 runner for FSU’s cross country team. 2011: Outdoor – advanced to the NCAA East Region at 800m on the strength of her Payton Jordan Cardinal Invitational win in a personal-best 2:05.67…also established a personal-best in the 1500 (4:21.53) when she finished sixth at the ACC Outdoor Championships. Indoor – made her FSU debut memorable, winning at the 800 at the Razorback Invitational, where she also contributed to a four-place distance medley relay finish…established an indoor collegiate best in the 800 (2:06.94) at the UW Husky Invitational, finishing fifth…scored as a member of the fifth-place distance medley relay at the ACC Indoor Championships and also advanced to the finals of the 800. 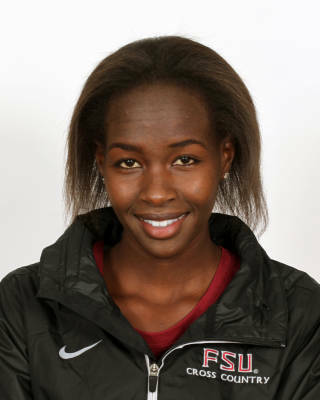 2011: enjoyed an outstanding inaugural cross country season for the Seminoles, earning All-ACC and All-South Region honors, where she placed fifth and third, respectively…helped FSU ascend to the No. 1 spot in the national polls and ultimately a fourth-place finish at the NCAA Championships…was seventh at Pre-Nationals after opening the season with a 16th-place finish at Notre Dame Invitational. Starred at Central Arizona for two seasons in cross country and track, winning multiple All-American honors…finished third at 2010 NJCAA Cross Country Nationals after a fourth-place finish in 2009…won multiple regional track titles in two seasons…capped her Central Arizona career by being named Athlete of the Year at 2010 NJCAA Track Nationals, where she won the 1500m, the 3000m steeplechase and placed third in the 800…comes from a legendary Kenyan running family, which includes her brother and guardian Bernard Lagat, who is the American record-holder in the 1500 meters, mile and 3000 meters…now considers Tucson, Arizona as her home…has five sisters and three brothers…brother Robert Cheseret is the only three-time Pac-10 Track Athlete of the Year, after starring at Arizona, where he was inducted in to the school’s Hall of Fame…majoring in nursing and sociology…aspires to have a professional track & field career…will have one year of cross country eligibility remaining in the fall…born March 1, 1989.